Mac Tweaker is the PUP that uses misleading techniques to prevent removal. Use Reimage to locate malicious components and get rid of them faster than with uninstall instructions. A full system scan blocks virus reappearance and prevents traffic to malicious domains. Mac Tweaker is advertised as an optimization tool that can clean and optimize Mac OS X system 10.7 & above. Similarly to MacKeeper, Mac Optimizer, Mac Mechanic and many others, this questionable application infiltrates users’ machines without permission. Thus, it falls into potentially unwanted program category. As soon as the unwanted app infests your system, it performs a computer scan. You should not be surprised that, according to Mac Tweaker, your system is affected by many issues that need to be addressed. As soon as you proceed and click “Fix” however, you are prompted to buy a full version of the program. A licensed version is subscription based and costs $39.95 every six months. You are also offered additional software that costs another $19.95. The service is expensive, especially when you combine it with questionable functionality. We highly advise refraining from this offer as the personal information might be used for questionable purposes (typically marketing); however, you can never know when your data might be misused, especially when payments are handled by 3rd parties, too. Thus, do not trust this program – remove Mac Tweaker immediately. The main problem with fake optimization tools is that all of them have a similar function: they mostly enter users machines through software bundling or advertisements, perform the scan, find hundreds of “issues” and demand payment for the alleged fix. The whole scheme is incredibly shady. Therefore, some people might call it Mac Tweaker virus (although it is not). If you want proper tools to protect your computer, select reputable security software, like Reimage. Not only can it help you with Mac Tweaker removal but can also detect other PUPs or even malware. Furthermore, junk files, trash, logs and other issues can be eliminated manually – for free. 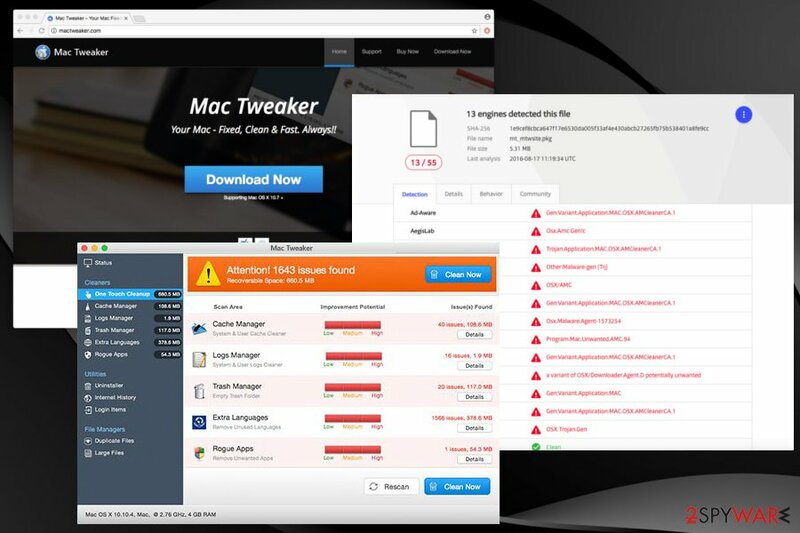 Mac Tweaker is a legitimate software, claiming it can clean and speed up Mac. However, its functionality raises doubts to security experts. The suspicious application can be distributed in two ways – downloaded and installed intentionally or installed together with other free software. As the PUP performs scan instantaneously after installation, confused and scared users might proceed with the full license purchase. Therefore, do not let questionable applications enter your Mac OS that easily – be attentive while installing freeware. The most important thing is not to rush the installation while clicking “Next” button without looking. By doing so, you might skip essential steps. Thus, read installation instructions carefully and always opt for Advanced or Custom installation mode. Make sure you deselect any pre-selected tick marks by add-ons, toolbars, optimization tools, etc. Security experts noted that fake optimization tools are not useful for your computer and should be avoided in the first place. However, if you noticed that your system is being scanned out of nowhere, remove Mac Tweaker at once. You can remove Mac Tweaker manually by using our guide below this article. Do not forget that you have to eliminate all related files in the libraries. Also, we do not advise picking this method if you are not that computer-savvy individual. You can also opt for automatic Mac Tweaker virus removal – it will only take a few minutes. Please pick one of the programs mentioned below, install and run a full system scan. 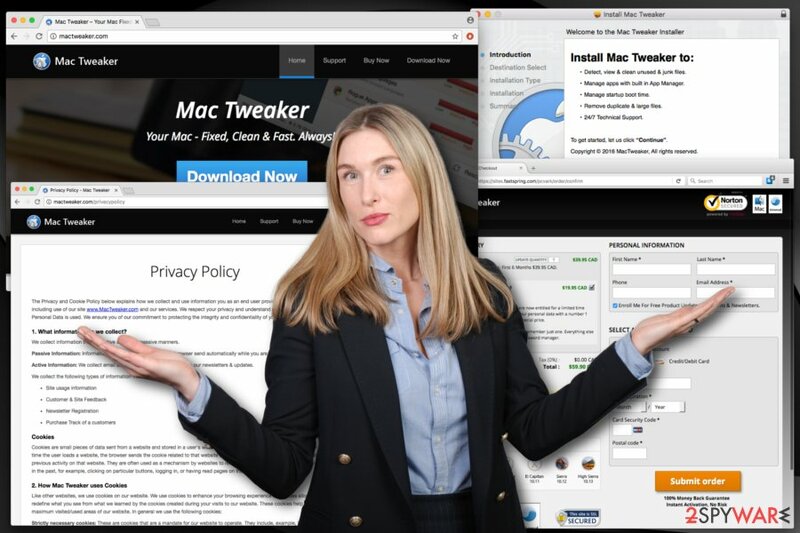 If you recently installed free software and obtained Mac Tweaker, it is highly likely that you have other PUPs installed on your system, like a browser hijacker or an adware program. Security software will detect all of these unwanted programs and eliminate them for good. Here, look for Mac Tweaker or any other recently installed suspicious programs. Wait until you see Applications folder and look for Mac Tweaker or any other suspicious programs on it. Now right click on every of such entries and select Move to Trash. When in the new window, check Delete personal settings and select Reset again to complete Mac Tweaker removal. Once these steps are finished, Mac Tweaker should be removed from your Microsoft Edge browser. Here, select Mac Tweaker and other questionable plugins. Click Remove to delete these entries. Now you will see Reset Firefox to its default state message with Reset Firefox button. Click this button for several times and complete Mac Tweaker removal. Here, select Mac Tweaker and other malicious plugins and select trash icon to delete these entries. Click Reset to confirm this action and complete Mac Tweaker removal. Here, select Extensions and look for Mac Tweaker or other suspicious entries. Click on the Uninstall button to get rid each of them. Now you will see a detailed dialog window filled with reset options. All of those options are usually checked, but you can specify which of them you want to reset. Click the Reset button to complete Mac Tweaker removal process. ^ What is a…PUP (Potentially Unwanted Program)?. Fraud Watch. Internet Security Company. ^ Brandon Jones. The Five Most Common Junk Files on Your Computer . PSafe. Leader in Security, Performance, and Privacy Apps. ^ DieViren. DieViren. German security experts. 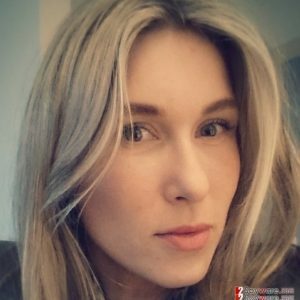 This entry was posted on 2018-03-27 at 02:57 and is filed under System tools, Viruses. You can quickly scan the QR code with your mobile device and have Mac Tweaker manual removal instructions right in your pocket. How did you remove Mac Tweaker?